The Lumineers are a folk rock trio which formed in Denver, Colorado, United States in 2002. 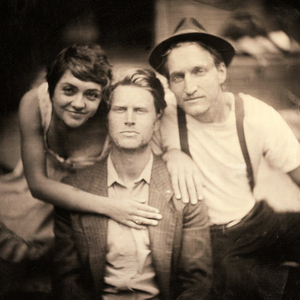 The band consists of Wesley Schultz (vocals, guitar), Neyla Pekarek (piano, cello, mandolin, vocals) and Jeremiah Fraites (drums, vocals). The band's debut self-titled album was released on April 3, 2012. The album's first single, "Ho Hey" reached #37 on the Billboard Hot 100 and #1 on the Billboard Alternative Songs chart. The Ho Hey Songfacts reports that Schultz and Fraites were originally based in New York and started collaborating in 2002 after Fraites' brother, Josh, who was also Schultz's best friend died of an overdose. The pair began writing and performing to cope with their grief and they later relocated to Denver, where they met the classically trained Pekarek after advertising for a cellist. A Denver, Colorado based group. The roots revival of the last few years has primed listeners for a new generation of rustic, heart-on-the-sleeve music?the kind that nods to tradition while setting off into uncharted territory. The Lumineers walk that line with an unerring gift for timeless melodies and soul-stirring lyrics.